Le Pic de l'Ours is perfectly placed in the heart of the resort amongst shops, restaurants and bars. 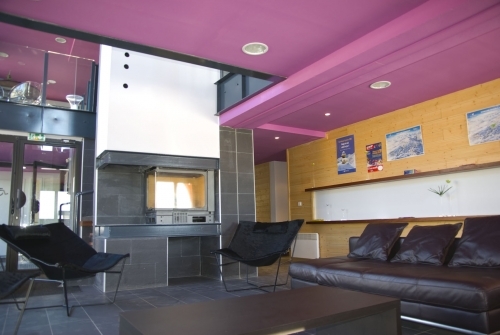 This comfortable residence is just 20m from the ski school and the resort Gondola that takes you directly to the ski slopes of Font Romeu in just 10 minutes. Le Pic de l'Ours in Font Romeu is located in the resort centre within close proximity to the shops and restaurants and just 20m from the closest gondola for an immediate access to the main ski slopes. 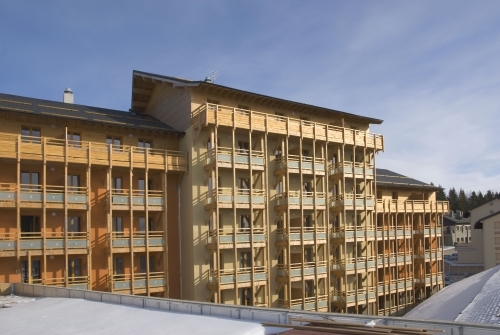 This recently built ski residence is composed of self-catering apartments, spread over 3 buildings (with lifts). Facilities at Le Pic de l'Ours include free access to the indoor heated swimming pool (10m x 5m, open Every day, 10:30 - 19:00), sauna and steam room (free access subject to availability), communal lounge area, luggage room, ski lockers (deposit required), children's play area, laundry room (payable), free Wi-Fi internet access in the main reception area and covered parking (payable). Cots, highchairs can be hired (all subject to availability). The loan of board games is also possible (subject to availability, a deposit is required). 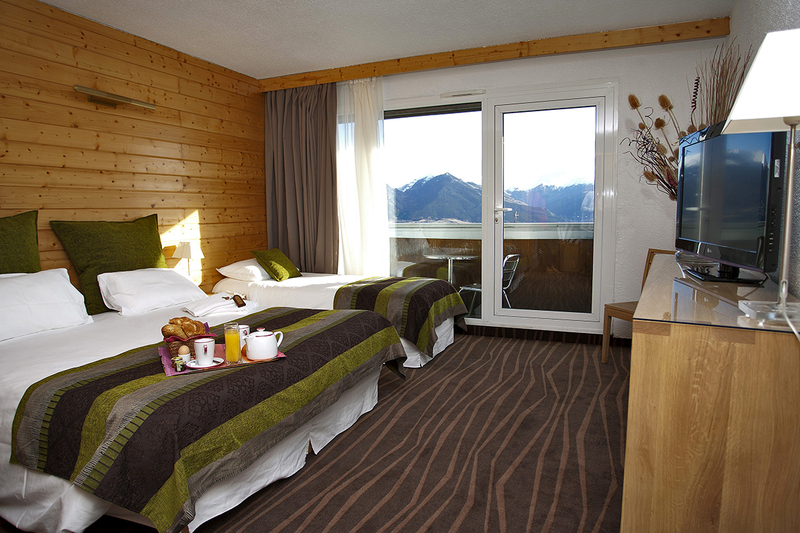 The self-catering ski apartments at Le Pic de l'Ours in Font Romeu are fitted and furnished to a high standard of comfort and convenience. The interiors are stylish and sophisticated with the use of dark wood. They all have a fully equipped kitchenette with ceramic hob with extractor fan, oven, fridge, dishwasher and coffee-maker, TV and a furnished balcony or terrace. Studio sleeping 2 (ca. 21m2) Open plan living/dining area with a sofa bed (converts to 2 single beds), bathroom & WC. 1 Bedroom Apartment sleeping 4 (ca. 35m2): Open plan living/dining area with a sofa bed (converts to 2 single beds), double bedroom, bath or shower room with WC. 1 Bedroom Alcove or 2 Bedroom Apartment sleeping 6 (ca. 50m2): Open plan living/dining area with sofa bed (converts to 2 singles beds), 1 double bedroom and 1 bedroom twin beds or alcove with window with bunk beds, bathroom and shower room & WC. 2 Bedroom Alcove Apartment sleeping 8 (ca. 66m2): Open plan living/dining area with sofa bed (converts to 2 singles beds), 1 double bedroom, 1 twin bedroom, 1 alcove with bunk beds with window, bathroom and shower room & WC. Please note: Alcoves are usually not enclosed, have bunk beds and no window. For any apartments at Le Pic de l'Ours in Font Romeu that feature bunk beds, sleeping in the top bunk is not recommended for children under the age of 6 years old. 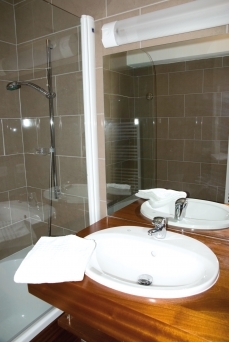 Fully equipped apartment, bed linen (Change payable), towels (Change payable), ski lockers (deposit required), Wi-Fi access at the reception, TV and access to the indoor heated swimming pool (open every day, 10:30 - 19:00), access to sauna (subject to availability, check on site). - Beds made on arrival: £23/apartment sleeping up to 4, £27/apartment sleeping 6 & £31/apartment sleeping 8. - End of stay cleaning (excluding kitchen area & dishes): £27/apartment sleeping up to 4 £37/apartment sleeping 6 & £45/apartment sleeping 8. - Beds made on arrival & end of stay cleaning (excluding kitchen area & dishes): £42/apartment sleeping up to 4, £56/apartment sleeping 6 & £68/apartment sleeping 8. - Optional covered car park (height limit 2.25m): £34/car/week. - Local Tourist Tax: €0.70/person 13yrs+/day (guiding fare). 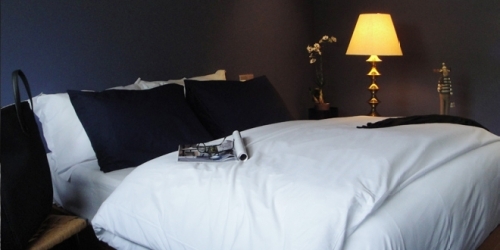 - Change of bed linen and towels: €7/kit each. - Hire of cot or highchair (0-2 yrs): €15/item stay (subject to availability, request at time of booking). Or both: €25/stay. - Launderette: €6/wash and €/4/dry. Only two pets per apartment are allowed and will be charged €44/pet/week (payable locally). A valid passport for your pet is compulsory. Board games (all subject to availability, deposit required). Arrival day at Le Pic de l'Ours is Saturday (and other days on request) 17:00 - 20:00 and departure 08.00 - 10:00. (contact residence by 18:30 if arriving late). Just 300m from the lively resort centre of Font-Romeu with numerous shops & amenities. 600m to the cable car (10 minute ride) to the ski slopes of Font Romeu Pyrenees 2000. Perfectly placed in the heart of the resort near shops, restaurants and bars. This comfortable residence is just 20m from the ski school and the resort gondola that takes you directly to the slopes. 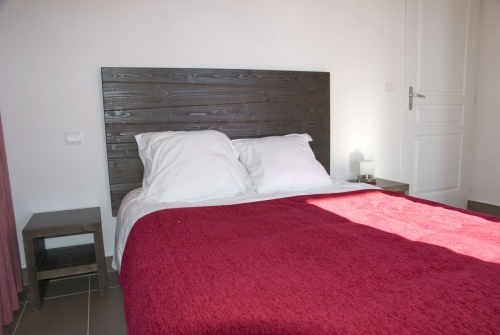 Residence Le Pedrou is ideally located just 350m from the cable car that accesses the ski area of Font Romeu Pyrenees 2000 and is in the heart of the village centre with its restaurants and bars. Contemporary-styled yet comfortable hotel, perfectly placed in the heart of the resort. 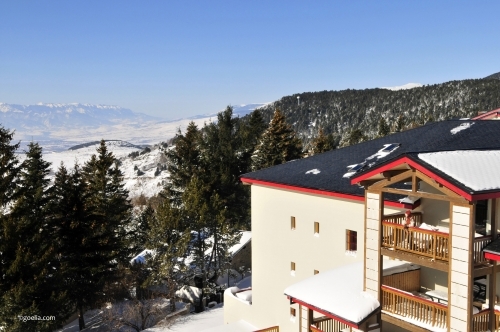 Just 200m from the ski school and the resort gondola that takes you directly to the ski slopes of Font Romeu. Located in the heart of Font Romeu, close to the shops, restaurants and bars and just 200m from the cable car that whisks you up to the slopes of the Font Romeu Pyrenees 2000 ski resort. 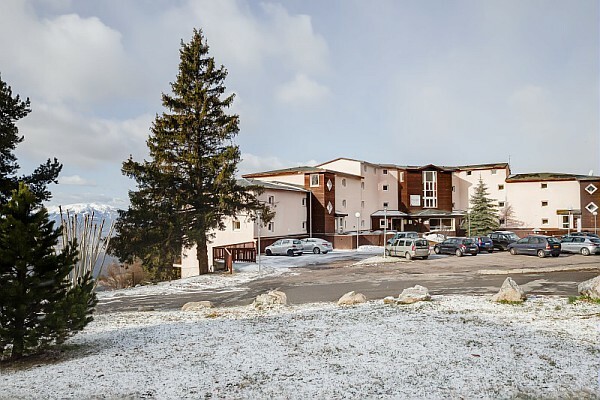 This centrally located family run hotel is close to the shops, restaurants and bars and just 200m from the cable car that whisks you up to the slopes of the Font Romeu Pyrenees 2000 ski resort.